If you’d like to experience the exhilaration of being part of a wild African herd, rather than just sitting on a safari truck and observing from a distance, an African horseback safaris might just be for you. Whether quietly trotting across the plains, cantering alongside inquisitive giraffes, or galloping away from big game, a horseback safari offers the chance to get up close and in amongst some of the world’s most beautiful – and dangerous – animals. This is the perfect holiday for the would be African adventurer. As with any safari, the amount you have to spend and the time of year you plan to travel will have a great impact on the cost of your trip. Prices can range anywhere between £150 and £500 per night, but you can’t out a price on such an unforgettable experience. The African climate differs between regions and countries, so check what the weather is typically like in a certain area before you book. If you’re after sweltering sunshine, planning a trip during the rainy season is not going to result in a happy rider! Another extremely important factor to consider is your riding level and ability. Whilst some horseback safari companies will accept beginner riders, this isn’t a trip that is generally recommended for those who don’t have a decent level of experience. The horses with any reputable company will be well trained, but riding conditions can be tough. Most companies are keen to point out that you are putting yourself in the path of big game, so if you aren’t able to gallop out of trouble, this might not be the holiday for you! Also bear in mind you will be spending hours on end in the saddle which, for those who know, can wreak havoc on your muscles! If you don’t have suitable experience but are still keen to have a go, look into trips that offer horse-riding as just one option within a greater itinerary. You could combine a walking or standard safari with a few days of riding, or spend a few days in the saddle and a few days on an African beach, giving your muscles time to recover! Some companies offer family-friendly options so the kids can also join in, but keep an eye out for minimum child ages, which in many cases is 12 years. Most trips can be tailor-made to ensure you get the exact experience you’re hoping for. You can travel alone and join a group out there ,or gather together some friends and have your own private group to ride out with every day. Accommodation can range from tented camps to luxury lodges, again dependent on your individual budget, and most package rates will include accommodation, food and drink, and your daily rides. An African horseback safari offers the chance to be at one with nature and to absorb the feeling of freedom that comes from being surrounded by the breathtakingly beautiful African animals and landscapes. If you’re a keen rider, this is definitely something you will want to experience at least once in your lifetime. 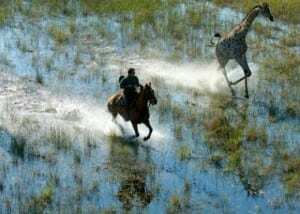 Namibia offers the chance to ride along the Okapuka River, while in Botswana you can explore the Okavango Delta and the arid lands of the Kalahari. Riders can also head for Zimbabwe and Victoria Falls for horseback trips through the Mopane Woodlands and Chobe National Park. Zambia offers stunning scenery and rides through private game reserves, and Mozambique has beautiful sandy beaches for peaceful exploration. In Tanzania is the Kilimanjaro region where you can ride the Maasai Steppe and see the true beauty of the Kukulewa hot springs. Head to Kenya for a riding safari experience along the stunning woodland of the Mara and Talek rivers, or venture to Uganda where you can ride alongside the world’s longest river, the White Nile. Take out proper insurance. This is important for any trip abroad, but even more-so when you plan on taking part in an activity such as horse riding. Pack as lightly as you can and don’t bring hard cases as you may end up travelling on small planes with little space. Check with your travel agent about luggage size before you go. In certain places you may ride through water or into rivers so bring waterproof boots and trousers, or even plastic bags to put around your boots which will save room in your luggage. Bring an extra light backpack or bag that you can carry on your back as you ride. In some places you can rent out gear, but it is best to check first. Check with your doctor as to what you’ll need in terms of innoculations and malaria pills. HorsebackSafaris offer advice and packages for horse riding safaris in South Africa, Botswana and Kenya. EquiTrekkingTravel can help you plan horse trekking trips worldwide, including Africa. AfricanHorseback offer a range of trip options and adventures, as well as advice on booking, what to bring and more.